Georgia is well-known for its Southern hospitality, friendliness and good food. This box is filled with goodies that represent the natural resources and lifestyle of the Peach State. Included is a wonderful introduction to what makes Georgia an ideal representative of Southern culture and cuisine. Check out Love, Mrs. Mommy's Review of Discover Our America, HERE! If you can't wait to find out if you won, you can take 15% off your first subscription box order with a Love, Mrs. Mommy exclusive code! Just enter LOVE15 at checkout, valid until 7/31. Disclosure: Love, Mrs. Mommy and Thrifty Nifty Mommy are not held responsible for sponsors who do not fulfill their prize obligations. 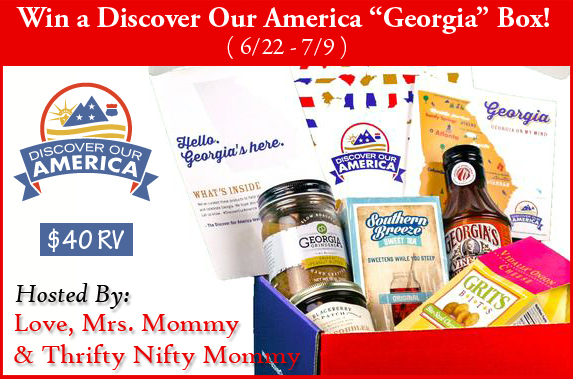 Love, Mrs. Mommy received the Discover Our America "Michigan" Box at no cost to facilitate the above-mentioned review. This giveaway is in no way endorsed or sponsored by Facebook or any other social media site. The winner will be randomly drawn by Giveaway Tools and Love, Mrs. Mommy will notify the winner by email. The winner has 48 hours to reply before a new winner will be drawn. If you would like to participate in an event like this, please contact LoveMrsMommy (at) gmail (dot) com. I really like this kind of giveaway. I wish more bloggers could do one for their own States too. It would be awesome to try foods from other places. This is a great giveaway. We get to try other states foods without going there.